Lock in a great price for Vistana Kuala Lumpur Titiwangsa – rated 8.2 by recent guests! Great location, close to Mochow station, but highly recommend Grab app to take a taxi. Room is clean, every facilities goes well. 15 mins to KL Sentral,15 mins to Twin towers,although it’s not in the heart of KUL. Thanks Faith&Faith for your warmly welcome, definately will stay here again! They should be flexible for check out time as most of the Hotels for international travelers. They were rather strict inspite of less occupancy. The bed like a cloud. I love it.... Get deep slept here. staff to use smile while talking on the phone. they dont smile. like talking to hang up the phone immediately. Very comfortable n i likes the pillow that they provided so much..n the toilet is very clean. The facilities are all excellent. The warm greetings from the bell boy and the house keeping staff. - Price was decent given the quality of hotel. - front staff was friendly and helpful. Vistana Kuala Lumpur Titiwangsa This rating is a reflection of how the property compares to the industry standard when it comes to price, facilities and services available. It's based on a self-evaluation by the property. Use this rating to help choose your stay! One of our top picks in Kuala Lumpur.Featuring rooms with a flat-screen cable TV, Vistana Kuala Lumpur Titiwangsa stands between Titiwangsa LRT Station and KL Monorail Station. It offers an outdoor pool and guests can enjoy meals at the in-house restaurant or have a drink at the bar. Free WiFi is available throughout the property. It is 0.9 mi to Putra World Trade Center and 1.5 mi to Quill City Mall. A 15-minute monorail ride brings guests to Bukit Bintang shopping area. KL Tower is 2.9 mi from the property. Kuala Lumpur International Airport is 43 mi away. Vistana’s modern rooms are fitted with ironing facilities and safety deposit boxes.Tea/coffee making facilities are provided. Bathrooms are en suite and come with slippers and free toiletries. Guests can approach the 24-hour front desk for currency exchange, concierge services and luggage storage. Friendly staff are fluent in English, Malay and Chinese. The in-house cafe serves up a variety of Asian and Western fare. 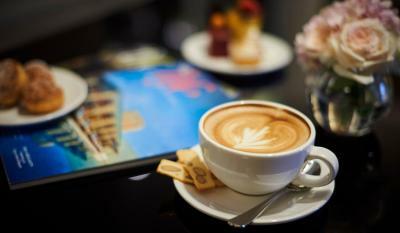 Barista Coffee Bar offers light refreshments throughout the day. When would you like to stay at Vistana Kuala Lumpur Titiwangsa? 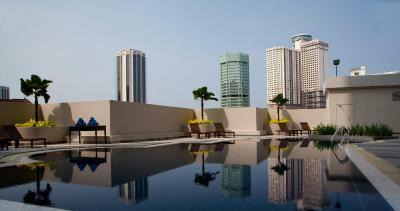 This air-conditioned executive room opens up to views of the city. The seating area is fitted with a satellite TV, mini-bar and a desk. The private bathroom includes shower facilities, a hairdryer and free toiletries. Ironing facilities are available. This air-conditioned deluxe room has a seating area fitted with a satellite TV, mini-bar and a desk. The private bathroom includes shower facilities, a hairdryer and free toiletries. Ironing facilities are available. Guests enjoy access to the Club Lounge. 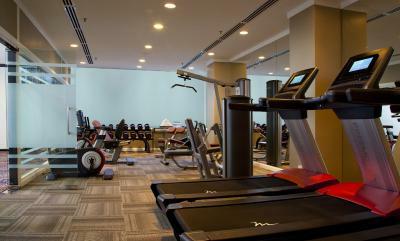 Vistana Kuala Lumpur Titiwangsa is located in Jalan Ipoh, in the vicinity of Titiwangsa, Kuala Lumpur, within close proximity to business and leisure environments. It is just 2-minutes walk from Hotel to Titiwangsa station. House Rules Vistana Kuala Lumpur Titiwangsa takes special requests – add in the next step! Vistana Kuala Lumpur Titiwangsa accepts these cards and reserves the right to temporarily hold an amount prior to arrival. Parking only available with one elevator. During rush hour, that could take a long time to get to my car. I went there for my exam. It was convinient to have exam and my room in the same building. The gym facility a little crowded with machine and treadmill. Not much empty space. And 1 air-condition is not working. Staffs super helpful, problem with the door and also kettle solve within 30minutes. There's very little not to like. This was our third time staying here: obviously we are quite satisfied with the hotel. We asked for room service, and they don't have any. Also, I think it could be a problem having a very late dinner as there's no restaurant open at night (I think, but I'm not sure of this). On the other hand, there are plenty of shops within less than two minutes of walking from the hotel, and many if you want to walk a little more: they are open all night. So the lack of a night restaurant is not an issue. It's great value for money. The location is excellent. Hot water perfect. Air conditioning perfect. Kettle. Iron. I don't know what more I could want. Staff very courteous. Only 1 lift to basement parking. So we need to get off at g floor n wait for another lift to go to basement. The tv in the room is the same level of our head when we lie down, so it's not comfortable to watch while lying down. The room is clean, bed and pillows are comfortable. The WiFi is damn slow it's as equal as not giving free WiFi. Since WiFi cost is cheap nowaday, the WiFi QUOTA should be revisited. Like - friendly staff, speedy check-in and clean room. breakfast ok. location ok. All ok. The room service i.e. the cleaner is very late to tidying up the room. Sometimes they'll only come to tidy up the room at 5 p.m. which is a time for a customers to take a rest. The location is very convenient. Close to the LRT/monorail station and walking distance to Chow Kit.